Last night was the “Superstar Shakedown” part one on Monday Night Raw that saw the likes of Bray Wyatt, The Miz, Alexa Bliss, Mickie James, and Dean Ambrose all make the switch from Smackdown Live to Raw. Your saying to yourself, wait a minute Dean Ambrose, the current WWE Intercontinental Champion is on Raw now? Yes it true and in the main event of Raw, he took on US champion Kevin Owens who we can only assume is going to make the jump to Smackdown Live tomorrow when part two of the superstar shakedown continues. Nonetheless, we had an amazing main event to watch after a night that featured Braun Strowman absolutely brutalize Roman Reigns to the liking of the crowd. When the match started the two began trading advantages with Dean getting the best of Kevin to start off the match as we headed into commercial break with a springboard crossbody to the outside. When we came back, Kevin was in control of the match, but a mistake saw Ambrose take control, but he wasn’t able to do much when he ran shoulder first into the steel post. Owens cemented the control with a big knee to Ambrose against the post. Kevin immediately put Dean right into a chin lock and he tried to wear Dean down hopefully so that he would submit. Dean was in a tough predicament, but when he tried to escape, Kevin was quick to cut it off by throwing him to the outside. Owens immediately went to the outside where he would pick up Dean in a fireman’s carry only to launch him ribs first into the steel post. When Dean beat the count to get back in the ring, Owens immediately worked on the rib area. Dean was finally able to create some separation in the match when he put his knees up when Kevin attempted a cannonball. He followed that up with a suicide dive to the outside as he threw caution to the wind as usual. With momentum on his side, Dean began taking control of the match with a swinging neck breaker and some clotheslines. After trading advantages back and forth, it was a mistake by Owens who tried to use Dean’s finisher against him that led to his demise as Dean was able to reverse it into the dirty deeds to pick up the win. Welcome to Raw Dean Ambrose! While JBL (John “Bradshaw” Layfield) may be a commentator and Rey Mysterio decided not to renew his contract and is now taking some heat for the death of El hijo Del Perro Aguayo, Jr., these guys once competed in the WWE and they clashed at WrestleMania 25 for JBL’s WWE Intercontinental Championship. 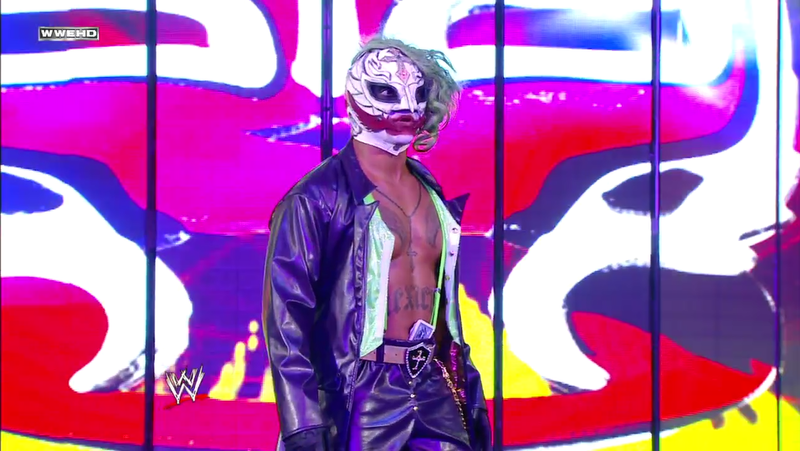 One of the cool things about having Rey Mysterio was seeing all the different outfits and masks he wore and at WrestleMania 25, he paid tribute to Heath Ledger’s Joker character. While the referee was starting to give the instructions, JBL kicked Rey right in the head sending him to the mat and he started to beat up Rey. But as soon as the referee rang the bell, Rey was able to hit JBL with an enziguri which he would then follow with the 619 and the pinfall victory in 21 seconds to become the new Intercontinental Champion. Right after the match was done, JBL announced that he had enough and he quit the WWE. As far as I know this was the last time JBL competed in a wrestling match. This match also marked the first time since WrestleMania X8 that the IC belt was defended at WrestleMania.